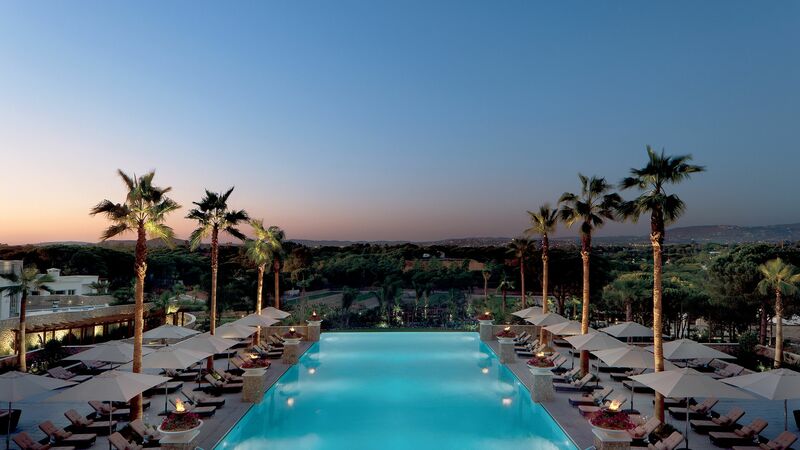 Modelled on the design of an 18th century Portuguese palace, Conrad Algarve is a luxurious 5-star hotel, sat in a privileged location by the picturesque Algarve coast. It boasts a sophisticated, contemporary design, overlooking landscaped gardens and the beautiful scenery of Ria Formosa Natural Park. Rooms are designed with relaxation in mind, featuring a bathtub with built in TV, a luxurious rain shower and cotton bath robes and slippers. The rooms are spacious and modern, with a mini bar and coffee machine. Each room even has its own private balcony overlooking the hotel’s expansive gardens or pools. 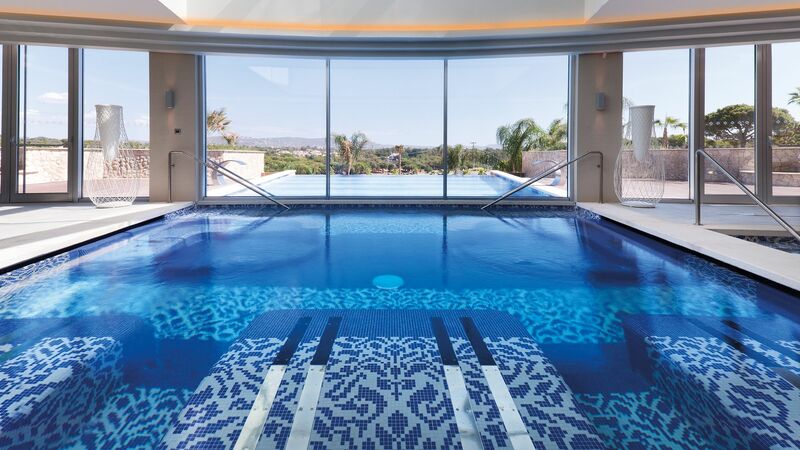 Conrad Algarve is perfect for couples and families looking for a relaxing getaway, where they can enjoy a world-class spa centre featuring aromatic steam rooms, a sauna and a heated infinity pool. 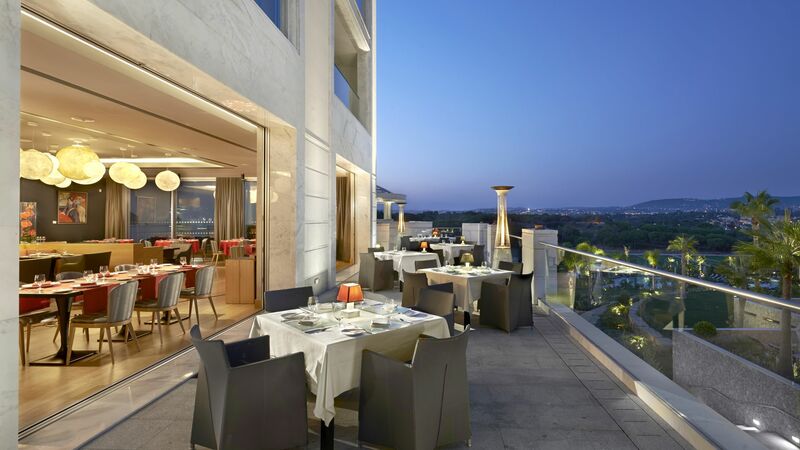 The hotel also hosts a range of restaurants and bars offering traditional Portuguese and Mediterranean cuisine as well the Michelin Starred restaurant Gusto by Heinz Beck. Located only 5 minutes from some of the Algarve’s most pristine beaches, with 30 top quality golf courses and the beautiful Ria Formosa Natural Park right on the doorstep, Conrad Algarve is perfectly located. Hotel child prices apply to ages 0–5 and 6–12 years. Gusto by Heinz Beck is a Michelin starred restaurant serving gourmet Mediterranean cuisine with a contemporary design and lively atmosphere. The restaurant is overseen by 3 Michelin Starred Chef Heinz Beck. Guests can enjoy a pre or post dinner cocktail and a Cuban cigar on the terrace of the adjoining Gusto bar. Guests can enjoy South American cuisine and an extensive collection of cocktails from the comfort of this casual poolside restaurant. Serving delicious Mediterranean dishes, guests will enjoy this Portuguese dining experience offering à la carte lunch and dinner. 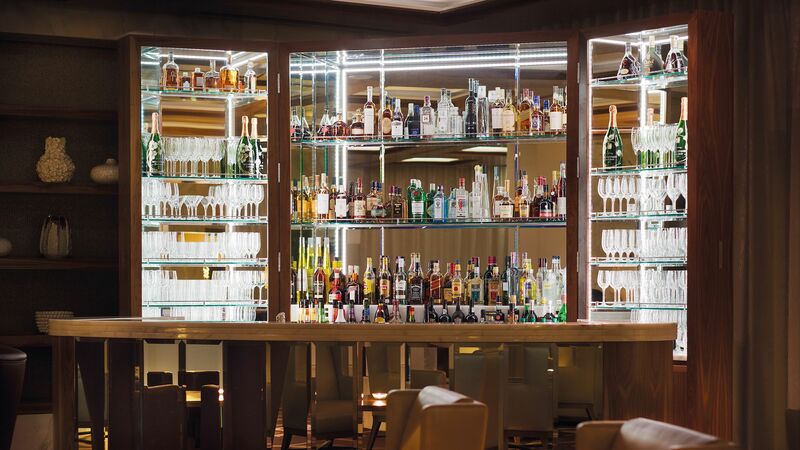 This sophisticated lounge offers local and international dishes to suit every taste. 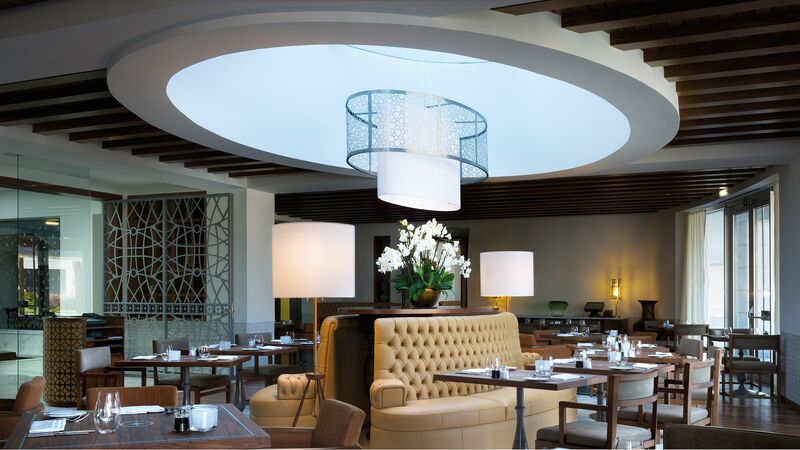 Lago provides a contemporary and inspiring design with a flair of Arabic influence. Providing a tropical flair, this restaurant treats guests to fresh seasonal fruit, cocktails and indulgent desserts. Open: 09:00 - 18:00 April to October. Half Board Plus is applied for 5 nights and includes a non-alcoholic welcome drink, 4 dinners in Louro Restaurant, 1 dinner in Lago Lounge, and a Wine Flight Experience. 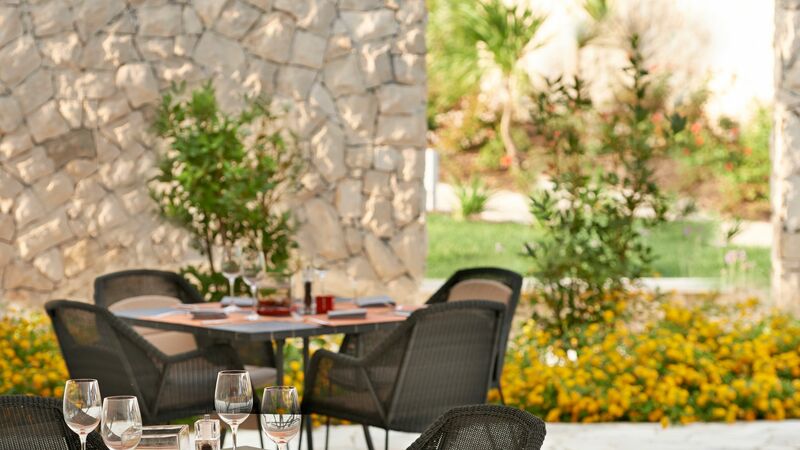 Half Board Extra is applied for 7 nights and includes a non-alcoholic welcome drink, 6 dinners in Louro Restaurant, 1 dinner in Lago Lounge OR 1 Sunday Barbecue (subject to availability) and a Wine Flight Experience. Additional nights on Half Board can be added for guests staying for longer durations. Please ask our Trusted Advisers for more information. 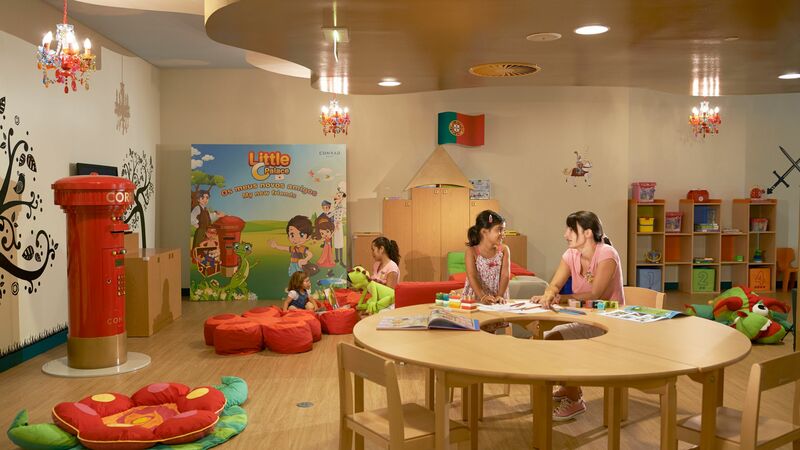 The Little C Palace features a wide range of fun activities, swimming pool games and a kids menu for children ages 3-12 years. Day time child minding is also available when requested 24 hours in advance. This world-class spa boasts aromatic steam rooms, a sauna and a heated infinity pool. Guests can also enjoy the five treatment rooms including the VIP couples suite. Conrad Algarve entertains guests with a games room featuring snooker tables and a putting area. 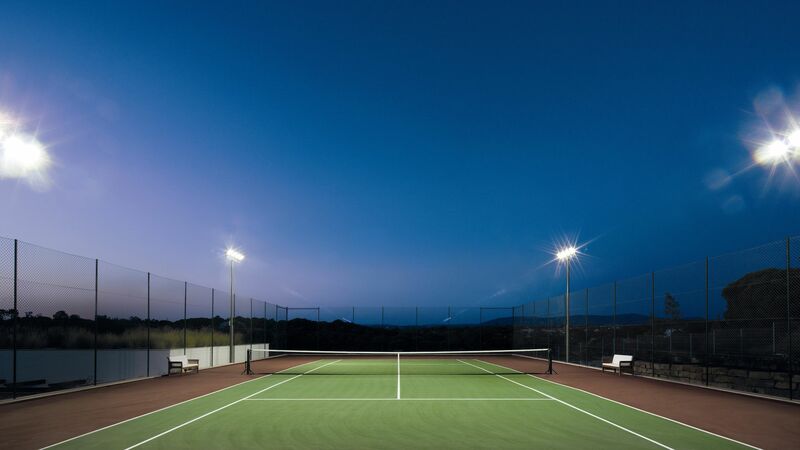 It also boats a multipurpose outdoor court for basketball, tennis and football. Those wanting to stay fit can enjoy the gym, yoga and fitness classes. Located between the towns of Vilamoura and Faro, Conrad Algarve is ideally situated for those wanting to explore both sides of Portugal’s Algarve. The hotel is found in Quinta do Lago where you can enjoy upmarket bars and restaurants, as well as a host of fantastic golf courses. The golden sandy beach is perfect for those wanting to simply relax, as well as offering a selection of water sports and activities. Land sports include tennis and horse riding, as well as mountain biking and hiking through the Ria Formosa Natural Park. If you prefer to explore some of the larger towns along Portugal’s south coast there are plenty of opportunities. Vilamoura is home to a swish marina and colourful houses, while Faro offers iconic beaches and traditional whitewashed buildings. Conrad Algarve is a 25 minute drive from Faro Airport. Deluxe Rooms are designed to carefully combine space, comfort and modern amenities for a comfortable stay, each also featuring airy balconies. Deluxe Rooms with Pool View enjoy splendid views over the pool, while enjoying the same space and comfort as deluxe rooms. Grand Deluxe Rooms enjoy all the same amenities as deluxe rooms, with the added luxury of enhanced space. Grand Deluxe Rooms with Pool View enjoy delightful pool views alongside their enhanced living space. Deluxe Suites with Pool View boast a 15m² balcony overlooking the swimming pool area and feature a separate living room and walk-in wardrobe. Grand Deluxe Suites with Pool View boast a 15m² balcony overlooking the swimming pool area and include the same amenities as Deluxe Suites with Pool View. Interconnecting rooms comprise of two Deluxe Rooms. Save up to 15% discount on the hotel price for holidays between 05 -12 May, 19 - 31 May, 24 June - 11 July and 01 - 31 October 2019, booked by 30 April 2019. “ We love this place! Having just returned from our third visit to the Conrad Algarve, I realise that I haven't previously reviewed the hotel so this is long overdue. We absolutely love this hotel - the staff, facilities and food are just wonderful. Having just got back, we are already planning another visit next year! On our first visit we stayed in the entry-level King Deluxe room, which is very spacious and well-equipped for a 'standard' room. On our second visit, our Hilton Honors status saw us upgraded to a one-bedroom suite which was incredible. On this most recent visit, we stayed in a pool view Twin Deluxe room (made up as a king bed) which had a lovely view from the balcony. All of the rooms have everything you need - a hugely comfortable bed, well-equipped bathroom (with bathrobes, slippers, a bath, shower and double sinks) and generous wardrobe space - so you can't go far wrong, but the pool view really does make a difference as a step up from the entry-level room. Each time we have stayed, Guest Relations have been extremely helpful ahead of our visit and staff on-site have done everything they can to make our stay run as smoothly as possible. On this occasion, we had an early flight and arrived around midday but having noted our flight time, the team were able to prepare our room early and give us access at 12.30pm. We also had a late flight but again, the team were able to offer a late checkout (as Hilton Honors Diamond members) which meant we could make the most of our final day. We visited Louro for breakfast, plus one lunch and one dinner, and each time the staff were exceptionally attentive and friendly. Breakfast is particularly impressive, with a huge range of options available; we particularly love being welcomed with bite-sized pasteis de nata, fresh orange juice and filtered coffee each morning. We like to go to the gym before breakfast so it is also helpful that breakfast is served until 11am. The gym is well-equipped for a hotel gym, and the outdoor space - which I have seen used for yoga, stretches and simply a rest from exercise - is also lovely. This was the first time we had visited the Gusto Bar, and we were very impressed with the cocktails, which included the head barman's special Easter cocktail. We would have stayed for several drinks had we not already made dinner reservations at Louro! I would recommend a visit to the bar if not the restaurant. This was our second visit at Easter time and the hotel really go all out with the celebrations, including beautiful displays as well as special food and drinks. On Easter Sunday I also spotted staff hiding Easter eggs around the grounds, presumably for the little ones to take part in an Easter egg hunt. That morning, we heard some very excited children running up and down the corridor (the only time we were really disturbed in our room) so it must be lovely for them to have the hotel make it so special for them. To address areas of criticism that have been referenced in other reviews: - On-site prices: this is a five-star hotel, and food and drinks are priced accordingly. The room prices give an indication of what to expect. We personally feel that the quantity and quality justifies the prices; there is also a convenience factor, as there are cheaper options nearby. To us, the 'premium' is worth it if we want an uninterrupted day by the pool or to enjoy room service on our balcony. The portions are generous and my husband and I often share a main dish (e.g. a salad, burger or pizza) and a side for lunch as it's more than enough. And as someone who rarely considers a salad as a 'main', they really are here! - Location: we have never hired a car when we have stayed here and don't consider it a problem. We are a couple without children so feel that there is plenty to occupy us on-site (gym, spa, pool, relaxing on the balcony, bars, restaurants) and nearby (the shopping centre across the road has shops, bars and restaurants and we have walked around the area quite a lot), but we've also asked the hotel to organise trips for us to Faro and Vilamoura in the past, which weren't unreasonably priced (around 30 Euros each way if I remember rightly). We always use Faro Airport Transfers to and from the hotel, at 25 Euros each way. Despite visiting three times we still haven't taken advantage of the hotel shuttle to the beach either - so that's on the list for next time! However, there is a car hire outlet in the shopping centre which makes it very easy to hire a car for a day or two if needed. As Hilton Honors Gold (previous) and Diamond (current) we have been able to benefit from additional perks during our stays, but from what we have seen and heard, all guests are treated exceptionally well here. I'm sure there are aspects of the experience here that I have missed, but let me just assure you that if you enjoy luxurious facilities, good food and drinks, relaxation and excellent service, this is the place for you. I am so glad that we discovered this resort and already can't wait to return! Conrad Algarve is such a beautiful hotel and the staff are so accommodating and friendly it makes for one of the best hotel experiences you can have in Algarve. We have stayed here many times and we are always well taken care of, everything about the hotel exudes quality and luxury. The breakfast is fantastic with a choice of over a dozen fruits, smoothies, juices, rustic breads, smoked salmon and other various cooked meats and a full hot buffet. Well equipped gym and my favourite spa of any Conrad hotel. I just love swimming in the infinity pool taking in the peaceful hillside views. The rooms are modern with a premium finish and include tv in the bathroom, Nespresso coffee machine and DVD player. Staff are amazing, it is great to see the same the faces year after year and Vera is a diamond, so down to earth and warm. One huge downside on this stay was a large group of unruly preteen children that were allowed to run riot by uninterested parents staying in rooms both adjacent and underneath ours, which had a negative impact on the enjoyment of our stay. However this was not the fault of the hotel and they did do their best to handle the situation, this has not happened before and hopefully just a one off. We are very much looking forward to returning to Conrad Algarve again in the near future. Such a lovely wonderful hotel with friendly efficient staff. Everything you desire is catered for with minimum fuss. We'll be sad to leave tomorrow but are already talking about our return. April is the best time to visit here as its not busy and the weather is still great. Some amazing resteraunts nearby including the hotels own. Could not recommend any higher. We ??? Conrad! My wife and I stayed at the Conrad Algarve last week. It was our first experience of the Conrad brand. We enjoyed our stay. The rooms were spacious, service very good and location ideal for golf and great local restaurants. He has a modern but rather clinical look.